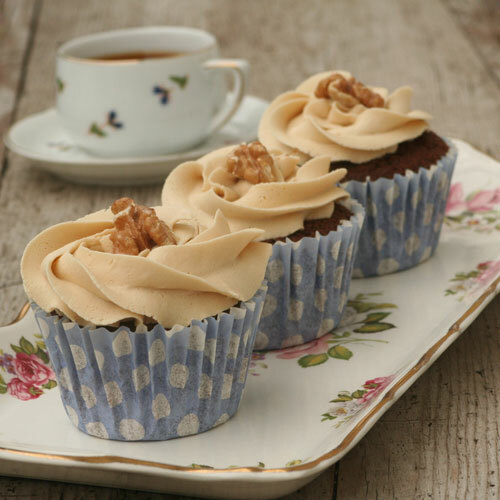 Alchemy in the Kitchen: Mocha Walnut Cupcakes – Made with Magic Beans! Pin It It is not every day you get to meet a man who sells magic beans. Unlike Jack (of beanstalk fame) I wasn’t taking my cow to market. I was waiting to be interviewed on the Morning Show on East Coast FM, when Stephen McCabe walked in, bringing with him a delicious aroma of freshly-roasted coffee beans. We got chatting and it turns out that Stephen is master roaster at McCabe’s Hand-Roasted Coffee. He had just been awarded two gold stars for his espresso – McCabe’s Classic Italian Blend – this year’s top Great Taste Award from the Guild of Fine Foods. This is an outstanding achievement by any stretch, but given they are a small family firm, up against some of the giants in the industry, it is doubly impressive. These are magic beans indeed. Dark chocolate coffee cake with a swirl of espresso frosting... about to do a disappearing act ! 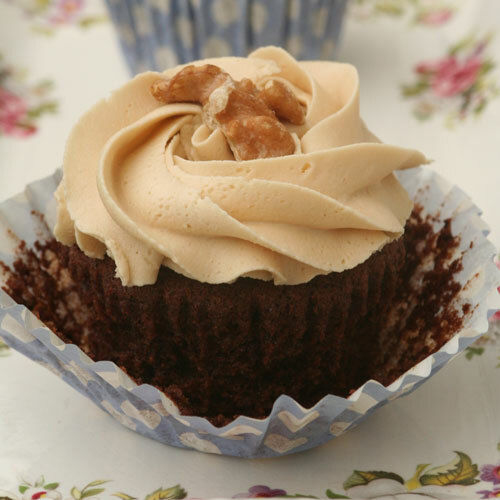 Stephen’s success has inspired these Mocha Walnut Cupcakes with Espresso Buttercream Frosting. I am, of course, using his magic coffee beans. 1 In a mixing bowl, beat the butter together with the sugars until smoothly blended. Add in the eggs one at a time, mixing well between additions. 2 Sprinkle in the flour, cocoa powder, baking powder and baking soda and continue beating until these dry ingredients are incorporated into the mixture. 3 Add the cooled strong coffee and the vanilla essence and mix until incorporated. 4 Divide the mixture between the 12 cupcake papers and transfer to the preheated oven. 5 Bake for 18 – 20 minutes or until risen and evenly golden. 6 Remove from the oven and transfer to a cooling rack. Leave to cool completely adding the frosting. 1 In a mixing bowl, slowly beat the butter together with one-third of the icing sugar until smoothly blended. Add in the rest of the icing sugar and the cooled coffee and continue beating until light and fluffy. I usually set a timer for 5 minutes to ensure gorgeous light frosting. 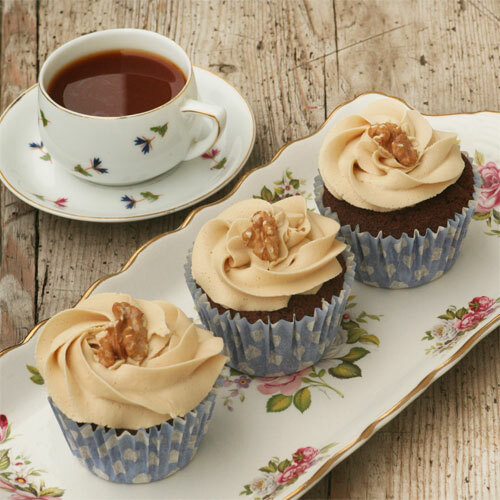 Transfer to the frosting delivery system cupcakes using a spatula, or pipe in generous swirls and top with toasted walnuts – the perfect complement to an excellent coffee. We're full of (magic) beans! I think I'd have to have one of those cupcakes for breakfast. What a dreamy combination of flavors! it sounds like a fancy coffee drink morphed into a dessert (instead of the other way around which seems more common these days). Your china is beautiful, expecially with fluffy frosted cupcakes on it! Hester, this is fabulous! Well done on the Morning Show and with your cupcakes. Way to go, girl. You ROCK! Have a great weekend Hester! These look delicious and great pics too. Will defo check out the McCabes coffee. The magic cupcakes are absolutely stunning! I'm sure they taste amazing - can I pre-order a dozen? How wonderful to meet someone like that and CONGRATULATIONS on the Morning Show! Awesome looking cupcakes, recipe has been bookmarked. Coffee and chocolate are such a lovely combination. Funny-by the title I thought this may have been some cupcakes made with some legume instead of coffee beans! Yum-buzz! That photo is so good I can almost smell the cupcakes. I want to make some! I would have loved to have heard you on the morning show! I don't suppose you still have the audio? Mmm, I love the combo of coffee and walnuts, so adding in chocolate to make it mocha is just another great addition. These are lovely! I love when small, family businesses get the praise. It makes me feel good about the world. So do cupcakes, incidentally. :) And these look fantastic! Congrats on the morning show too....so cool! Buzzed you big time for these! I love coffee and walnut and these look DEEEELICIOUS. Also extremely lovely to look at. Great work. YUM. I adoreee the classic coffee/walnut cake combination but havnt had it in far too long! These little cupcakes look so so delicious and the recipe seems pretty straightforward, saving it for sure :) You have a really lovely blog which i will be visiting again for sure! This recipe sounds delicious and your pictures of it are beautiful. You have a great blog and congratulations for making the Top 9 on FoodBuzz. Mouthwatering pictures, and great recipe! Congrats on top 9! Wow these muffins looks gorgeous and I am sure they were delicious! I will have to try McCabe's coffee on my next trip to Ireland. I reall enjoy good cofee. These look delicious. I see you broke out what my mother would have called "the good china" it was only taken out for priests and the mother in law LOL. Delicious frosting! Congrats for the Top 9.
p.s....and I love your teacup and plates! Great recipe! Have a nice week. This coffee sounds wonderful and the cupcake with espresso and espresso frosting sound incredibly delicious, a perfect treat for breakfast! Extremely tempting cupcakes, with espresso coffee flavour! I can't resist now. The recipe sounds perfect! Thanks for being my foodbuzz friend!! These would be perfect for breakfast. They look beautiful! Hester just a quick note I just wanted to let you know that I love your blog so much I am sharing these awards with you! They are on my blog so come and get them! Those are beautiful cupcakes. I love the tray you put them on, too! I see you hit Top 9 while I was in post-bar catatonia. Congrats! These look so, so delicious. I'm a massive caffeine addict, but I think I just got a transatlantic morning wakeup just looking at the amount of coffee in this recipe. I love it; so delicious...magic, even. Espresso Buttercream Frosting -- now that sounds like heaven. I want magic beans! AND a tub of that icing!!! This looks deadly, can almost smell the coffee... will definitely be making it soon!